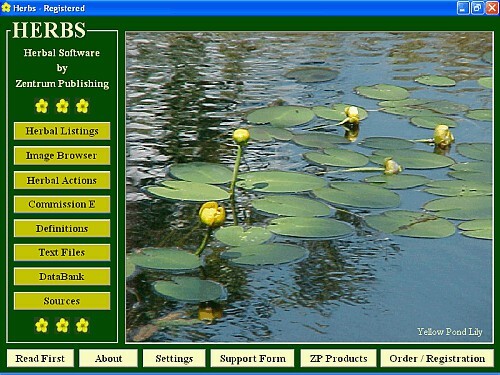 Herbs 4.4 is other software developed by Zentrum Publishing. This herbal software describes herbs and herbal actions of over 500 plants. Look up the equivalent botanical name of a herb in English, German, French, Chinese, Sanskrit (Ayurvedic). Poisonous herbs carry a warning and known side-effects are listed. Also includes phytochemical information, references to the German Commission E, and photos of 100 selected plants. Bonus with purchase: MDB, a DataBank to add your own entries, delete and print. This other software is shareware, which means you can download and use Herbs 4.4 for free during the trial period (usually for 30 days). At the expiration of the period you will have to buy the other product for $16.95. Herbs 4.4 is available at regnow and Zentrum Publishing website. Herbs 4.4 supports different languages (including English). It works with Windows 98/XP/Vista. We have tested Herbs 4.4 for spyware and adware modules. The software is absolutely safe to install. We has completely tested other software Herbs 4.4 many times, written and published the interesting article and uploaded installation file (8581K) to our fast server. Downloading Herbs 4.4 will take minute if you use fast ADSL connection.